The forecast for December 14th called for a clear sky with no chance of rain. I knew that I was in the clear (pun intended) to try and snap some pics of the meteors. I’ve taken plenty of pictures of space objects before. It just so happened that I also had a Christmas party to attend during the peak of this shower, so I went outside earlier in the day to set up my rig. I decided to try a new method for focusing on this shoot. Since I wasn’t going to be home in time, and the Moon wasn’t going to rise until after 11pm local time, I figured I’d try to focus on the Sun during the day and see how that’d work out for me during the night. Later in the night, my brother (thanks for helping by the way) went outside, turned the camera on, and lo and behold I forgot to turn automatic focus switch off. The camera tried to automatically focus on the night sky and since it was too dark, the focus was completely out of whack. Luckily Jupiter (one of the brightest objects our night sky), was out, so had my brother re-focus the camera and start the intervalometer. I only managed to snap about 64 photos before dew started forming on the lens. Dew, Frost, and a bit of Science! I have used hand warmers in the past to keep dew and frost from forming on my camera lens and I thought I could get away without using them this time. Truth be told, I actually ran out of hand warmers and I really just need to find the time to build my DIY lens heater. Turns out I couldn’t get away with it this time, but there is an interesting tidbit that I want to mention about dew. I find it fascinating that dew can form on objects outside even when the ambient temperature hasn’t reached the dew point. I think it’s time for a little science lesson! Imagine a cool winter night with a clear night sky, an ambient temperature of 40° F, and a dew point of 34° F. One might think that dew or frost would never be able to form in this scenario because the ambient air temperature hasn’t yet reached the dew point but it is certainly possible. It happens more often than you might think. It’s possible because of thermal radiation. Let’s break it down a bit further. The air outside can only contain a certain amount of water vapor. This higher the temperature, the more water vapor the air can hold. Quickly, think of a hot, humid day. Alright, now back to our winter night. On a cool winter night, many objects such as grass, cars, metal sheds, and even cameras, aren’t able to conduct the heat that is found deep in the ground fast enough. Basically these objects radiate the heat faster than they can absorb it. The temperatures on the surfaces of these objects eventually cool to below the dew point (34° F in this example) and thus dew or frost begins to form on them. Pretty cool, huh? Like I said before, because of thermal radiation, I only managed to snap 64 photos before dew started to form on my lens. That being said, I am happy that I was able to capture at least one meteor in that time span! If you haven’t taken the time to observe a meteor shower, I highly recommend that you find an opportunity next year! The Perseids in August (especially true in 2015 because of the new Moon), the Orionids in October, and the Geminids in December are some of the best meteor showers to watch. 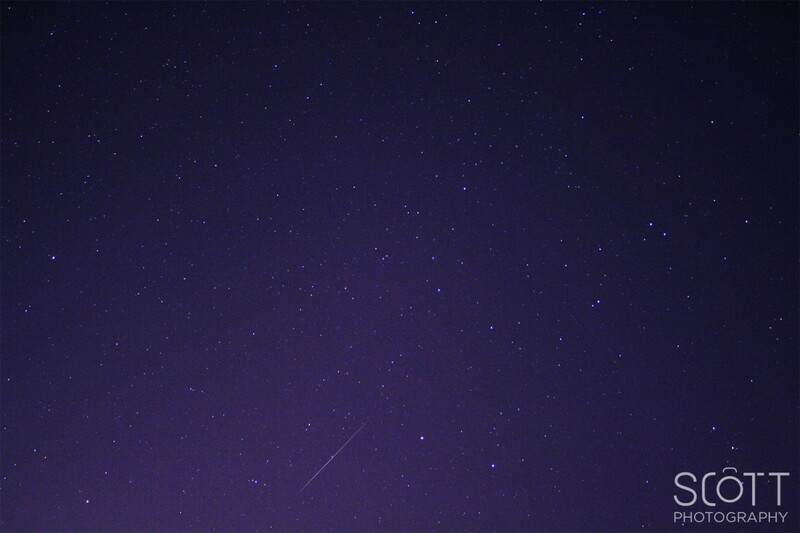 The best part about watching a meteor shower is that it takes minimal effort: all you have to do is look up! Thanks for reading along and sticking with me through the mini science lesson. Oh, and one last thing before I go: can you spot the north star in the my photo? Let me know in the comments! This entry was posted in Long Exposure, Space and tagged in geminid, meteor, meteor shower.